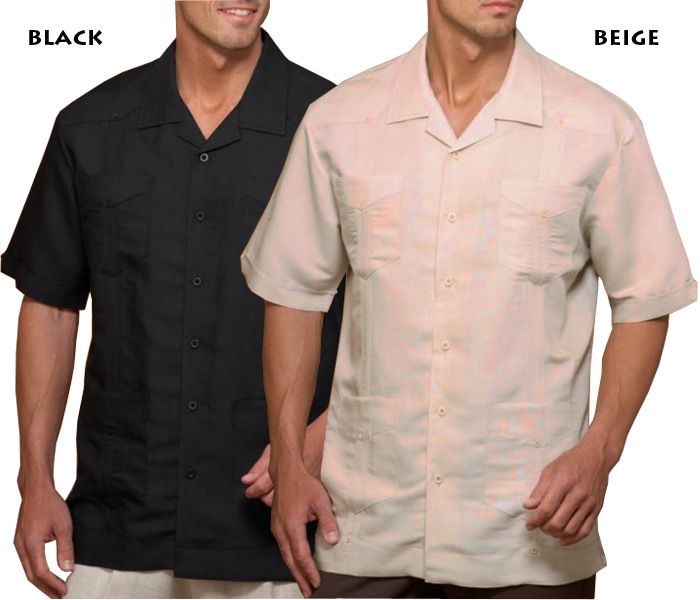 Men's Guayabera Four Pocket Shirts are available in Bright White, Jet Black and Natural Stone-Beige with various fabric blends. 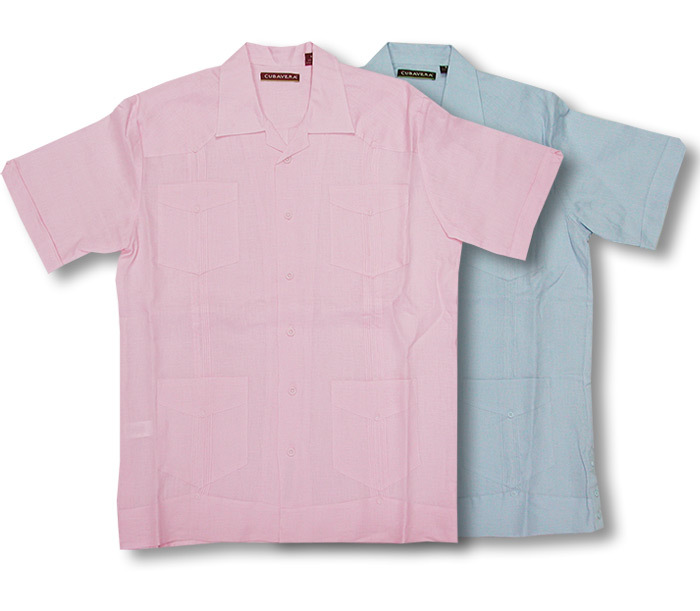 Available in Bright White, Cashmere Blue and Gossamer Pink in 100% Linen. Ramie is an ancient fabric that looks and feels like cotton, but stronger. Ramie Fabric is created from a flax-like fiber that comes from the stem of an herb with broad leaves and dense branches. Ramie, also known as "China Grass", is a flowering plant native to eastern Asia. For centuries, ramie fiber has been used for making fabrics and clothing. 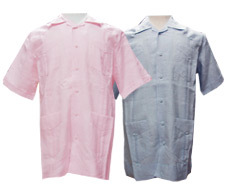 In fact, ramie has been used for clothes since at least 5000 - 3000 BC in Egypt. Ramie fibers are one of the strongest natural fibers. Ramie can be up to 8 times stronger than cotton, and is even stronger when wet. Available: Bright White-Ramie/Rayon - Small = 5 in stockBeige-Raime/Rayon - Small = 6 in stockJet Black-Raime/Rayon - Small = 3 in stockBeige-Linen/Cotton - Medium = 2 in stockBright White-100% Linen (+$9.00) - Small = 2 in stockCashmere Blue-100% Linen (+$9.00) - Small = 2 in stockGossamer Pink-100% Linen (+$9.00) - Small = 3 in stockGossamer Pink-100% Linen (+$9.00) - Medium = 6 in stockWHEN MAKING YOUR SELECTION: It's always agood idea to choose an alternate print or color justin case the item has become Temporarily Out of Stockor has Sold Out. This will prevent delays, refundsand partial shipments. You can choose youralternate/s by using our (Special Instructions Box)located below the area where you enter your emailaddress while checking out.YOUR SELECTION CHOICES ARE IMPORTANT TO US:We will NEVER substitute a purchase with analternate without your approval.SALES UPDATES: Are posted daily. And all listingsare subject to prior sale. Detailed inventoryinformation can be found by clicking on the link(Available Selections Information) located on thebottom area of any page throughout MauiShirts.com.Mahalo.